FAQ & Policies - chanojas Webseite! I can reserve your piece for free for maximum 1 week = 7 days. If you want to reserve it for longer, I will need a down payment. I am aware that my wearable art is quite an investment so I understand that you may need some time to pay it off. Thats why I welcome split payments. Please send me a message to arrange a payment plan. My prices are in Swiss Francs. At the moment its more or less 1:1 with USD. I recently decided to offer free shipping. I have included these costs into my item prices. Generally, I send my creations with tracking number. In case a package is lost, be assured that I will work with you on a fair solution! Customer care is important to me! I want that your shopping experience with me is a pleasant one, even when something goes wrong. When the item price is low compared to the shipping costs, I may decide to send it UNREGISTERED which is always mentioned in the product description. My packages are mostly recycled and I don't charge anything for them. Damage due to your doing: I offer to repair it for free whenever possible, but shipping both ways is at your cost. Shipping damage: I wrap your items securely but accidents can happen. Should it be faulty once received, I will accept its return in order to repair it. Send me a photo within 7 DAYS of receipt. It may be easier to repair it by yourself. Contact me to discuss the matter and read Care instructions. In this case, the shipping both ways is at my postage cost. Once I receive the item, if the problem cannot be rectified, a full refund (not including shipping) will be given. I send most of my items with tracking number. You will receive a confirmation email from etsy with the tracking number. Track it at www.post.ch/en, see "Track consignments" on the left lower corner, enter your tracking number in the box, click on "start". Please note that for some countries, the Swiss tracking only shows the info up to the Swiss border. After that, you need to track it at your local posts offical tracking page. US customers: Once the package has entered the US, you can track it within the US at www.usps.com. I love inspiring custom orders and I will do them whenever possible! But note that every piece is unique and never a copy of another item. 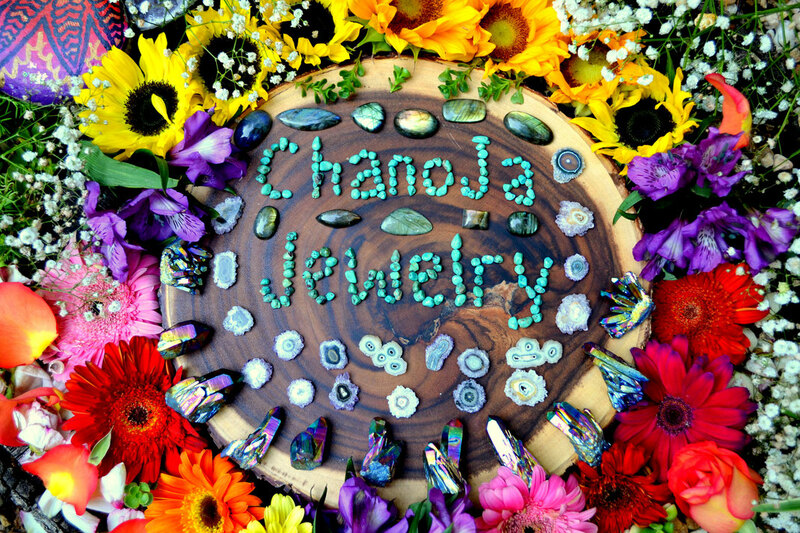 All ChaNoJa items are carefully and lovingly handcrafted, therefore one of a kind. Every single creation exists only once! The photos of my items are taken in Macro (close up) and I've added one photo with my hand so you can see its approximate size. If you need accurate sizing, please message me. The length of the cord is always mentioned in the description. Also - the colors may appear ever so subtly different depending on lighting and also can vary with different computer monitors. I don't offer wholesale as all my creations are one of a kind and no two items are exactly the same. In some special cases I can give a discount, just ask me letting me know the reason why you would want one. Every one of my sweet "babies" will come securely packaged in bubble wrap and in a colorful little organza or rustic bag or paper box. If you have a special wish, please contact me. Your piece is clay art and should be treated with care! Don't get it wet. Water can loosen the gemstones & may cause the clay to become brittle. A bit of rain will not affect it, wipe it gently with a cotton cloth. Don't swim or shower with it. If exposed to constant direct sunlight, it will fade over time, especially the eyes. Clay is strong, but dropping it onto a hard surface may crack it. If this happens, use a FLEXIBLE super glue like Loctite Gel Control or Gorilla Glue Gel. Many 2-part epoxy glues work well. Avoid cheap superglue in tubes (Cyanoacrylate). Apply on tiny surfaces with a toothpick. Ensure that the cord is in good condition, are knots tight & secure? If a knot opens or you have to replace a cord, google "sliding knot tutorial". I cannot guarantee the shipping times. Actual delivery time will depend on your local postal services, weather conditions and pure luck! Delays can always occur, it can be that it takes up to 10 working days more for places like Australia, Russia or Turkey. Contact me within: 14 DAYS of delivery and send a photo of the damaged piece.